These vary according to which type of brace you have, but are essentially all the same. The bracket is a small metal or ceramic square that is glued to each individual tooth. Remember if a bracket becomes detached from a tooth, then the tooth will not be moving in the desired direction and the brace will need to be repaired. The metal wire that is tied onto all the brackets and thus joins all the teeth is called an arch wire. The gentle pressure from the arch wire is what helps to move your teeth. Ligatures, ormalasts or modules are very small elastic bands that hold the arch wire onto each bracket of your braces.These can come in a variety of colours. 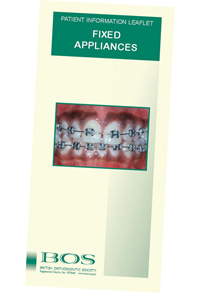 Some braces do not require these as they are “self-ligating,” this means the bracket itself has a metal clip built into it. Towards the end of treatment hooks are placed on the arch wire to attach either elastic chain or elastic bands to. The elastic chain helps to close any spaces while the elastic bands are attached between the top and the bottom brace to help to correct your bite or centerlines.